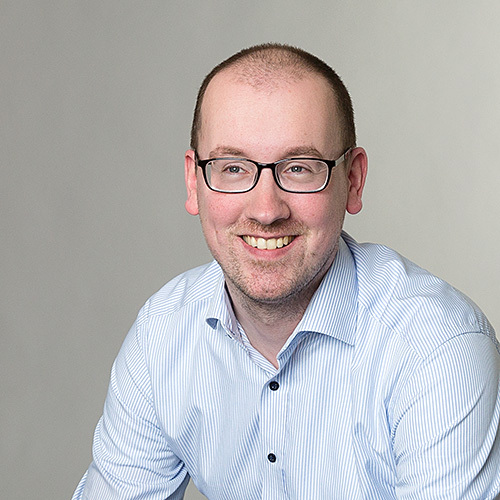 A few weeks ago I already wrote a post about the cool things that are possible by using Orchestrator in combination with ConfigMgr 2012 (and MDT 2012 Update 1). This week I ‘m going to show that there are even more cool things possible by using Orchestrator in combination with Runbook Commander and ConfigMgr 2012. Runbook Commander is a great free tool made by Neil Peterson and is actually a dynamic console extension for ConfigMgr that allows for console initiated execution of Orchestrator Runbooks. So actually this is a very cool tool to create custom right-click tools for ConfigMgr. Anything that is possible to run on a client via Orchestrator can be added as a right-click action in the console. The only limitation is a persons own creativity! Runbook Commander 2.0 needs to be installed on a system with the ConfigMgr 2012 console. The user account used in the RBC XML Generator needs to have administrative rights on the local system and needs to be member of the OrchestratorUsers. The user account used during executing the right-click actions needs to be member of the OrchestratorUsers. Register, Deploy and Configure the System Center 2012 – Configuration Manager Integration Pack. Add an Initialize Data –activity and double-click it. In the Details Information click Add and a new parameter named Parameter 1 will be added. Now click Parameter 1 and change the name to Computer Name: click Ok and click Finish. Note: It’s really important to use exact the same parameter name, because the RBC XML Generator tool will only return runbooks with that specific parameter name. Other possibilities are Collection ID: and Program Name:. Add a Perform Client Action –activity, link it with the previous activity and double-click it. In the Details right-click the field next to Computer and select Subscribe > Published Data. 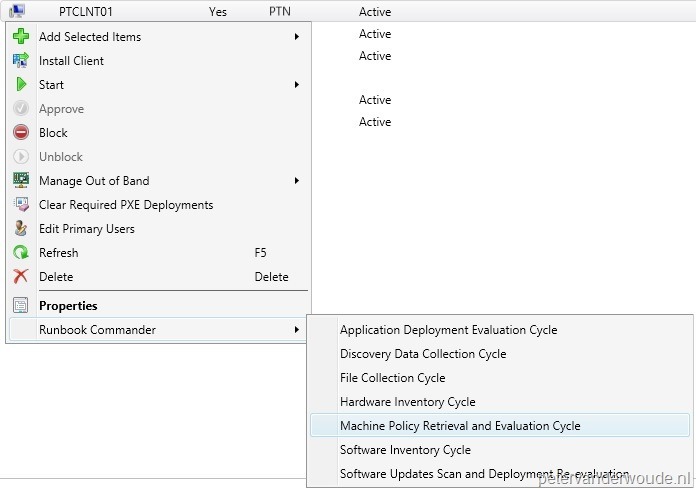 In the Published Data –popup, select with Activity Initialize Data, select Computer Name: and click Ok Then select with Action Machine Policy Retrieval & Evaluation Cycle and click Finish. I choose to create seven different runbooks, like the one above, for all the different client actions in the Perform Client Action –activity. There are different methods to create something similar, but I prefer it this method. The reason for that is simple, I want all the actions directly in the menu. 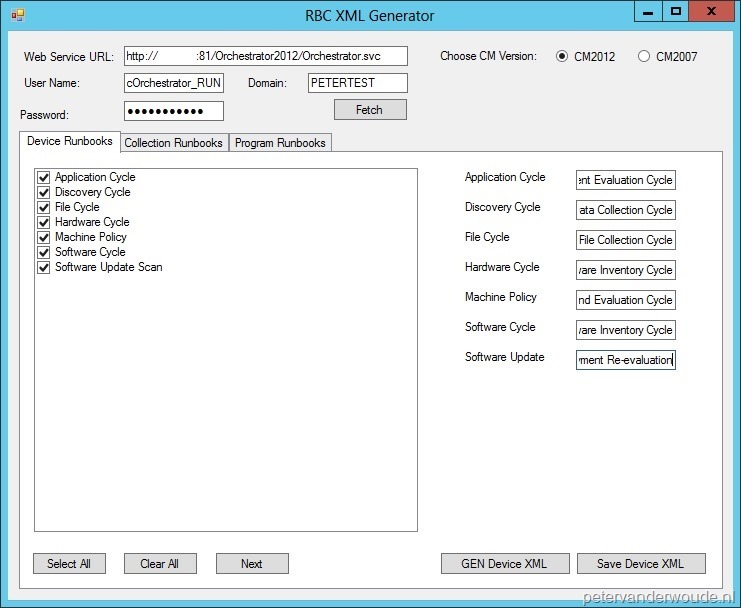 Navigate to the installation directory and double-click RBCXMLGen.exe to start the RBC XML Generator. Fill in the Web Service URL, User Name, Password, Domain and click Fetch. Select the just created runbooks in the Device Runbooks –tab and click Next. Note: Runbooks with parameter name Collection ID: can be found in the Collection Runbooks –tab and runbooks with parameter name Program Name: can be found in the Program Runbooks –tab. Fill in some friendly names for the runbooks, select with Choose CM Version CM2012 and click GEN Device XML. Note: Click Save Device XML to use the generated XML –file for a silent install of Runbook Commander. Restart the Configuration Manager Console. Now it’s time for the really, really cool part, THE RESULTS! The best part, in this case, can be found in the console by right-clicking a system. In the menu it will show an extra node named Runbook Commander and under there all the custom actions can be found! Take a look at the picture on the side for an example. So from this moment on every action, that can be build in Orchestrator, can be easily transformed to a right-click action in the console. The last thing I would to show is that it also really works! For that I like to show the Activity Details from the Orchestrator Console and from the ConfigMgr client side the SMSClientMethodProvider.log. Together these two things show that the activity started the action successful on the client.